After the death of the Muslim prophet Muhammad in 632, Islam spread like a bloody tide throughout the Arabian peninsula, north to the Caspian Sea and east through Persia and beyond, westward through Egypt and across North Africa all the way to the Atlantic Ocean. From there it crossed the Straits of Gibraltar and consumed all of the Iberian peninsula, or al-Andalus as the Saracens called it. In a mere one hundred years, Muhammad's aggressive legacy was an empire larger than Rome's had ever been. By 732 that fallen Roman empire had devolved into a patchwork of warring barbarian tribes. When Abd-ar-Rahman, the governor of al-Andalus, crossed the Pyrenees with the world's most successful fighting force and began sweeping through the south of what would become France toward Paris, there was no nation, no central power, no professional army capable of stopping them. No army except one  led by the Frankish duke Charles, the eventual grandfather of Charlemagne. His infantrymen, as Victor Davis Hanson puts it in a fascinating chapter of Carnage and Culture, were "hardened veterans of nearly twenty years of constant combat against a variety of Frankish, German, and Islamic enemies." Hanson writes that the Roman legions had crumbled "because of the dearth of free citizens who were willing to fight for their own freedom and the values of their civilization." But Charles had spirited, free warriors under his command who were willing. Sometime in October (the exact date is disputed), on the road between Poitiers and Tours (and so it is sometimes called the Battle of Poitiers) less than 175 miles from Paris, Abd-ar-Rahman arrayed his cavalry against Charles' solid block of Frankish footsoldiers, which at 30,000 was by some estimates half the size of the Arab and Berber army (Hanson speculates that the armies were more evenly matched). The opposing forces sized each other up for a full week. And then on Saturday morning Abd-ar-Rahman ordered the charge. But his cavalry, which counted on speed, mobility, and terror to defeat dying empires and undisciplined tribes, could not splinter the better-trained and better-armed Frankish phalanx. At the end of the day's carnage, both sides regrouped for the next day's assault. But at dawn, Charles and his men discovered that the Muslim army had vanished, leaving the booty stolen from ransacked churches behind, as well as 10,000 of their dead  including Abd-ar-Rahman himself. It was not the last Muslim incursion into Europe, but it was the beginning of the end. Some contemporary historians downplay the magnitude of the Muslim threat, claiming that Abd-ar-Rahman's force was only a raiding party. They minimize the significance of the battle's outcome, too; at least one historian even claims that Europe would have been better off if Islam had conquered it. But Hanson notes that "most of the renowned historians of the 18th and 19th centuries... saw Poitiers as a landmark battle that signaled the high-water mark of Islamic advance into Europe." Edward Creasey included it among his The Fifteen Decisive Battles of the World. Many believe that if Charles  whom the Pope afterward dubbed Martel, or "the Hammer"  had not stopped Abd-ar-Rahman at Tours, there would have been nothing to prevent Europe from ultimately becoming Islamic. Edward Gibbon called Charles "the savior of Christendom" and wrote in The History of the Decline and Fall of the Roman Empire in 1776 that if not for Charles' victory, "perhaps the interpretation of the Koran would now be taught in the schools of Oxford." If only Gibbon could see Oxford now. Not only is the interpretation of the Koran taught there, but Islam thrives in Oxford, thanks partly to the patronage of dhimmi Prince Charles. In his essay "Islam in Oxford," faux moderate Muslim scholar Muqtadar Khan writes smugly that "Gibbon would have been surprised to learn the lesson that military defeats do not stop the advance of civilizations and the globalization of Islam is unimpeded by the material and military weaknesses of the Muslim world." Apart from his dubious suggestion that Islam has anything to do with the advance of civilization, Khan is right. Today the Islamic invasion of Europe and the rest of the West is of the demographic, not military, sort. The continent faces an immigration crisis from at least one generation of young Muslims, many of whom not only are willfully unassimilated, but who are waging cultural and physical aggression against their hosts, establishing parallel communities ruled by sharia and "no-go" zones of violence toward infidels. "Nothing can stop the spread of Islam," insists Islamic apologist Reza Aslan. "There are those who would try, but it simply will not happen. Absolutely nothing can stop the spread of Islam." 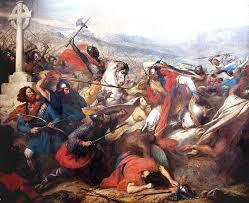 But Charles Martel begged to differ in 732. The tide was turned back then, and if necessary it can be turned back again, by new Martels. The conflict is different now  it's far from being as straightforward and elemental as two armies facing off  and so those new Martels won't necessarily be soldiers. They will also be culture warriors and activists and ordinary citizens willing to put themselves on the front lines against this new incursion. We need "free citizens willing to fight for their own freedom and the values of their civilization"  as Charles Martel and his warriors once were.